There are hundreds of books that describe how to paint landscapes. I usually can’t stand most of these so called instructional books because there isn’t enough information on the process used to create a finished landscape. Before I start I will assume the reader has a basic understanding of color, color mixing and working with oil paint. If not you may not get as much out of this article. 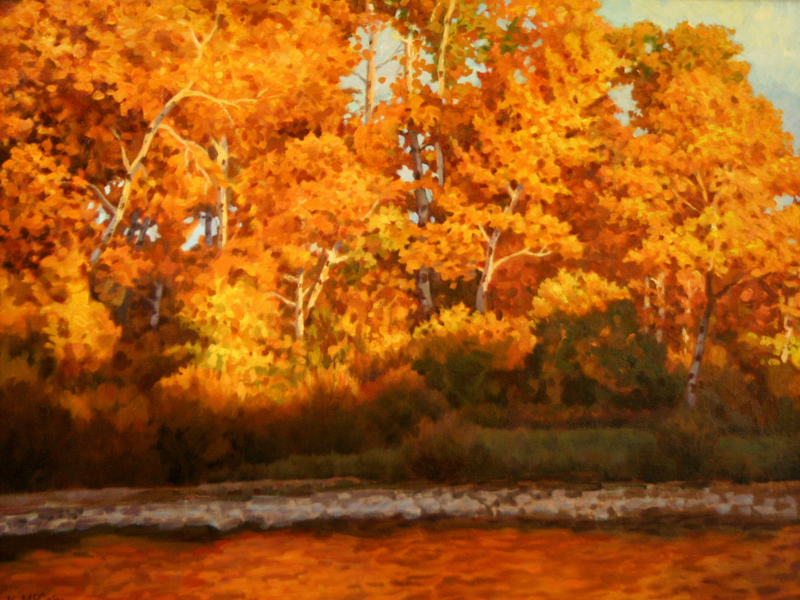 The good news is I have plenty of blog posts that talk about the fundamentals of oil painting. Now let’s return to the landscape painting. When I start a landscape I look for something that catches my attention which usually is the light and the color. I have always been fascinated by color and I am drawn to the artists who use it and use it well. I was raised in Arizona where the sun it intense and bright even sometimes overwhelming. 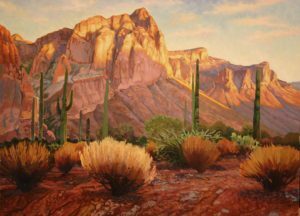 This light reveals the wonderful color of the Senora Desert which I enjoy painting because of it’s diversity. As I travel looking for inspiration I am looking for the color and light that I find so fascinating. Once I find something that inspires me the real fun begins. That means it’s time to start painting and my paintings almost always start with the drawing. Drawing is the most important thing in you painting because it defines the structure, perspective and edge relationships. It helps to work out initial ideas of composition and most importantly it helps you understand what needs to be changed to make the drawing and eventually the painting to look better. A solid drawing is the foundation of a good painting. Never underestimate the importance of a good under drawing. Many times I draw out my paintings completely. Especially if they are complex subjects or compositions. Most of my drawings are completely free hand to describe the gesture and composition. This time I used the grid method for proportion and perspective. There are several reasons to use grids other than trying to copy photographs to get accurate placement, the reason this time was to help the perspective or size proportion of the foreground vs. the bluff and mountains in the background. I used an hb charcoal pencil to begin the grid. I divided my 48″ x 36″ canvas into six inch squares which worked out to be 6 rows and 8 columns. 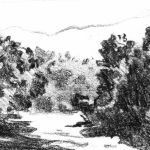 I used several sources for reference, about four photos, as well as 2 plein air paint sketches and one studio painting using these I drew out my composition. 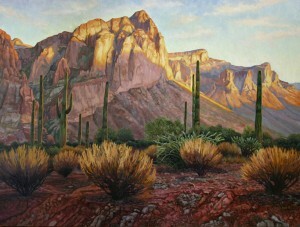 Changing and positions of cactus and redrawing bushes that didn’t look right or were unclear. With something as complex as this drawing I began to wash in some basic colors as I develop the drawing. This paint is very thin about the consistency of whole milk or half and half. It’s slightly transparent and doesn’t hardly cover the charcoal lines. This bit or color helped to clarify the sky from the background and so forth. I wasn’t done the with drawing of the foreground, but these areas of color helped me as I continued to draw in the foreground. I quickly saw some problems in the foreground I decided to place the same sort of bushes from the right side on the left side as well, that way the right and left sides of the painting would look unified and I could use the repeating shapes and their relationships to create more depth in the painting. As I continued to work to cover the canvas I decided I wanted to put a second layer on the mountains to correct some of the drawing. So the basics shapes I modified some things were left in other shapes I took out completely. I looked for the lighter values and smaller shapes to clarify what is happening on the bluff. The previous picture looks flat and without a lot of form. I looked for changes in direction on the bluff I looked for where the wall was flat and where it popeds out a bit or cut back a bit. The changes in direction will change value and color slightly so basically I took the large shapes and added the smaller shapes which represent the changes in direction. These read as details. I also added detail to the furthest ridges in the background some of the initial drawing was clumsy so I redefined and redrew that area in paint. I got to a point where I was satisfied with the background so I returned to work on the foreground. I made the contrast on the front bushes in the foreground much brighter. I needed more contrast of value and color in the foreground and less in the background if I didn’t do this the background would try to jump into the foreground and the painting would appear flat. This stage is kind of like cleaning a messy garage where there is a time while you are cleaning that it looks messier than when you started. So as I continued to workout basic shape and ideas some areas looked almost finished while others not only look unfinished but completely wrong. I wasn’t worried because this was still the “rough in” stage. There is a saying with painting or drawing that it has a life cycle to a painting or drawing there are times when you are bringing the art to life and other times when you are killing it, this bringing art to life and killing it can happen several times on long paintings or drawings. The important thing is to quit working on the art when it is coming to life once again. 2. Repaint the bushes in the foreground especially the largest one that seemed to glow. 3. 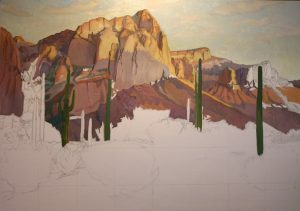 Repaint the rocks and dirt in the front to clarify, give more detail and help the foreground come forward. 4. Background cliffs on the left were confusing and unclear I needed to restudy the values and shapes to clarify that area. 4. Second Paint Layer – Refining and Developing This was a very important stage of the painting. I went back and made the corrections I noted earlier and the painting was really starting to come together after the changes. I used thicker paint in the foreground to not only cover any left over under drawing but many develop and clarify the half tones. The paint I used in the second layer was thicker about the consistency of soft sour cream or softened butter. I took my time to develop the details in the foremost bush in the foreground. I also did a little redrawing of the other front bushes changing their shapes and redefining their colors. There are still areas that haven’t been touched since the” rough in” like the saguaros. 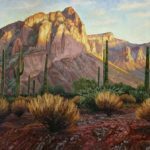 The reason for this was I knew that if I didn’t get the foreground to work correctly with the bushes and rock and dirt it wouldn’t matter how well done the saguaros were painted. So I was still looking at the broad relationships such as are the shapes interesting enough, is there enough contrast in the foreground and less contrast in the background, is there a definite middle ground and are there any colors too bright or in the wrong place . I began to introduce more texture into the bushes and the rocks and earth. This was helping but it still looked like I needed to increase the contrast in the foreground overall with brighter lights and richer darks. The rocks and dirt weren’t finished nor did they look convincing so I noted that I needed to change that as well. I used a very direct type of painting technique there was no glazing, or even dry brushing it was painted with opaque colors over other opaque colors. There were places that I still hadn’t addressed, because there were still too many big issues to resolve between the background and foreground. So I continued to tackle the big issues. So I darkened the trees in the middle ground these were silhouetted against the brighter light of the background and helped to separate the background from foreground. I finished the bushes and the rocks and dirt which I gave more details higher contrast and help the foreground to come forward visually. I finally finished the saguaros and then decided to darken them slightly again to increase contrast. I softened the multi-branched cactus. I made sure to keep the reds in the rocks and dirt in the foreground slightly bluer red so it didn’t read as warm light. I needed the oranges and yellow on the distant mountains to be the only colors to look warm. If the red of the rocks and dirt had been too warm or orange red they would have felt like they were in light not shadow. With all these changes finally I was happy with the painting and it did everything I wanted. So it was time to stop and call it finished.